Merchant and prominent philanthropist; born at Bischofsheim-on-the-Tauber, 1773; died at Mayence Jan. 22, 1814. He went to Mayence during the French Revolution, and from a small merchant became a purveyor to the army. 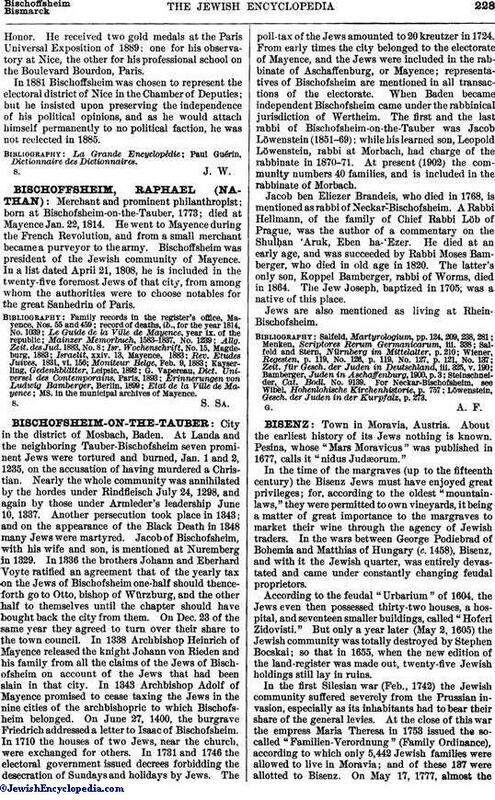 Bischoffsheim was president of the Jewish community of Mayence. In a list dated April 21, 1808, he is included in the twenty-five foremost Jews of that city, from among whom the authorities were to choose notables for the great Sanhedrin of Paris. Etat de la Ville de Mayence; MS. in the municipal archives of Mayence.